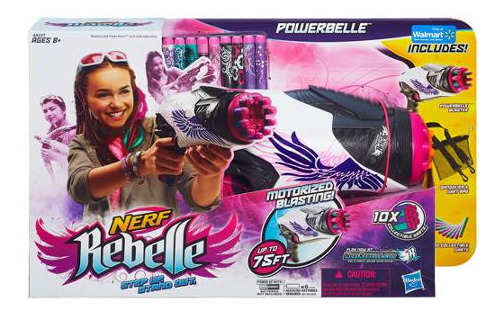 Nerf Rebelle Powerbelle Blaster Only $15.30 + FREE Store Pickup (Reg. $30)! You are here: Home / Great Deals / Nerf Rebelle Powerbelle Blaster Only $15.30 + FREE Store Pickup (Reg. $30)! I LOVE how Nerf has started making these for girls! And right now we can even snag a pretty awesome deal! Get this Nerf Rebelle Powerbelle Blaster for Only $15.30 + FREE Store Pickup (Reg. $30) if available in your area. Otherwise, shipping is FREE with any $50+ order or just $4.97.